If you're on the lookout for a casual yet totally stylish outfit, consider teaming a white crew-neck t-shirt with blue acid skinny jeans. Both pieces are totally comfy and will look fabulous paired together. When it comes to shoes, this look pairs nicely with black leather chelsea boots. 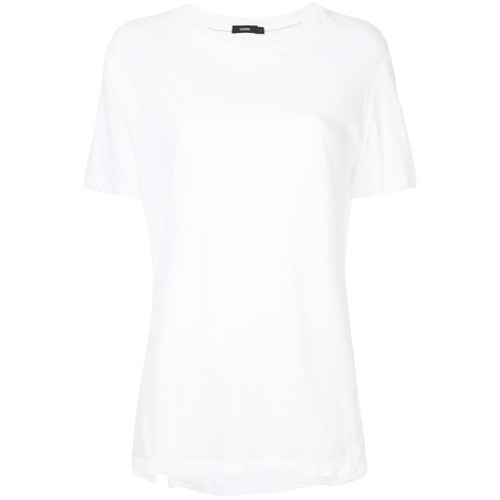 If you're searching for a casual yet absolutely chic look, wear a Bassike classic vintage t shirt from farfetch.com with navy jeans. Both garments are totally comfy and will look fabulous paired together. When it comes to shoes, this outfit is finished off nicely with black leather ballerina shoes. 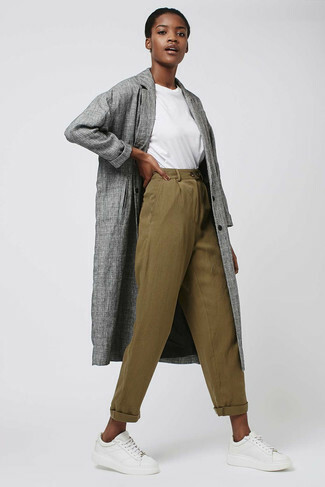 If you're hunting for a casual yet absolutely chic ensemble, wear a Bassike classic vintage t shirt with tan wide leg pants. Both items are totally comfy and will look fabulous together. Bump up the cool of your look by finishing off with beige leather heeled sandals. Marry a Bassike classic vintage t shirt with olive chinos for a lazy day look. When it comes to shoes, this ensemble pairs wonderfully with white leather low top sneakers. A white crew-neck t-shirt and black leather skinny pants are the kind of a winning casual look that you need when you have zero time to spare. And if you wish to effortlesslly class up your look with a pair of shoes, why not complement this ensemble with a pair of black velvet ankle boots? If you're after a casual yet stylish look, make a Bassike classic vintage t shirt from farfetch.com and black leather shorts your outfit choice. Both pieces are totally comfy and will look fabulous together. Black leather ankle boots will instantly lift up even the laziest of looks. 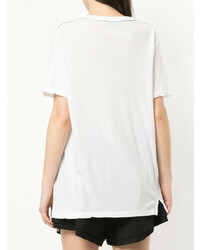 Make a Bassike classic vintage t shirt from farfetch.com and black leather leggings your outfit choice for comfort dressing from head to toe. When it comes to footwear, this outfit is round off nicely with white canvas low top sneakers. 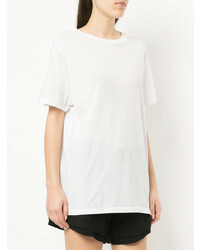 If you're hunting for a casual yet totally chic outfit, wear a Bassike classic vintage t shirt and black skinny pants. Both items are totally comfy and will look fabulous paired together. And if you want to instantly up the style ante of your look with one piece, enter tan leopard suede loafers into the equation. If you're after a casual yet chic look, dress in a Bassike classic vintage t shirt from farfetch.com and a burgundy pencil skirt. Both items are totally comfy and will look fabulous paired together.